I first met a couple traveling with this combination in Australia about 5 years ago. Here is a video of the 230 which fits perfectly in a back of a small pickup and weight only 611 kilo. Here a few more video from this company -quite impressive I think. I can't believe that stayed upright though all those donuts. Looks like a great combo. I am not sure I would like to do the tricks he does with his camper but I can confirm that a few mods on the suspension will allow the unit to be thrown about like that. I am now thinking of a LR 130 but am concerned that the narrow wheelbase might make the vehicle lean a lot in cornering. The Ford Ranger has a slightly wider wheelbase plus spaces. Nice combo too, it's too bad that we don't have these smaller units available here in the US. What about the Northstar Escape Pod? Not bad but I have feeling like the construction is not as good as the German Tisher with their molded shell. Seems heavier. But I may be wrong. Love that skylight with the screen. That seems like a lot of space for the given footprint. I like the fold down sink and all the headroom in the bunk. Christian, would that unit have served you well on the Africa journey or would it have been too big for (tall?) for certain parts. Could you expound a little on what leads you to prefer a more space after your Africa journey, or link to something where you may already have explained it? After the 9 months on the road, there are 2 requirements that I really want to meet -> more power and a permanent bed. And my gf really insists on a proper toilet for emergency. The biggest problem I see with this combo is the height. I am also going to loose a bit of "offroading" capability. On the other hand, I hope that I will be able to just drop the camper and use the pick-up only when we are somewhere for several days. We have looked a lot at the various pop-up campers on the market (including Marc's excellent XP) but we feel like we want a hard-side camper so we can walk in anytime, for lunch, nap, surfing, video processing, etc, whatever we need to do on the road. 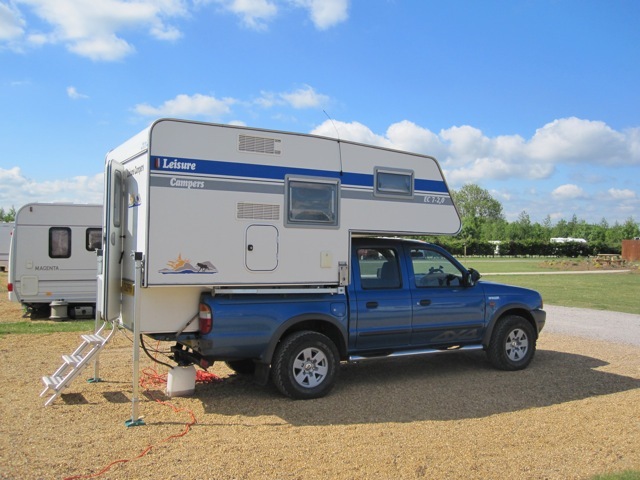 So for in North America, the best truck camper I have found would be the BigFoot 1500. There is only really one problem, it's about 3 inch too wide to fit in a container. 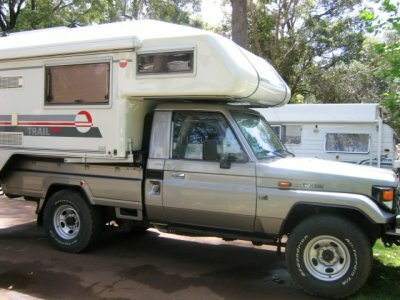 As I said, if money wasn't a problem and the logistics possible, my first choice would be a new HJZ79 with the V8 and this Tisher camper, or the Azalai integrated camper. Would the Tisher camper fit in a container? I had a look around a Land Rover with the Azalia conversion at a show recently. The quality and the finish is superb. Notice the love-hate relationship I am experiencing with our rig at the moment? It is only due to the rainy season in Central America. It truly is an awesome rig and very near perfect, there will always be compromises.